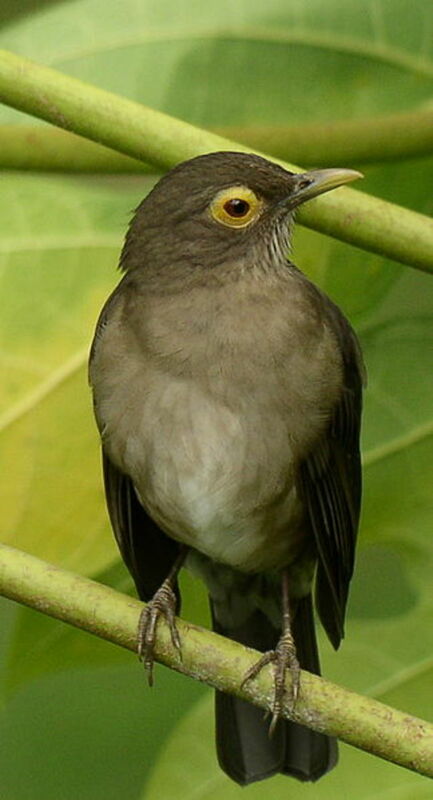 The Spectacled Thrush, Bare-eyed Thrush, or Yellow-eyed Thrush, is a resident breeding bird in the Lesser Antilles and in South America from Colombia and Venezuela south and east to northern Brazil. The Spectacled Thrush is 23–24 cm long and weighs 60 g. It is plain olive-brown above and paler brown below. The throat is brown-streaked off-white, and the lower belly is whitish. It has a prominent yellow eye ring which gives rise to its English and scientific names. This is a destructive bird, and eat all fruits even green ones.